In an address broadcast on Russia’s main TV channels, Prime Minister Dmitry Medvedev has said the country needs to wean itself off its dependence on oil prices. In order to accomplish this, Russia needs to develop innovative projects and use the sanctions imposed against it to its own advantage. Prime Minister Dmitry Medvedev has called on the country to reduce its dependence on oil prices and focus on developing high-tech commodities, amid predictions that the ailing Russian economy will slip into recession in 2015. In a speech broadcast on Russia’s main TV channels, Medvedev said that Russia “eventually” needs to get off the oil needle, although he did admit that the financial reserves generated from oil exports have given Russia the tools it needs to survive the current situation. 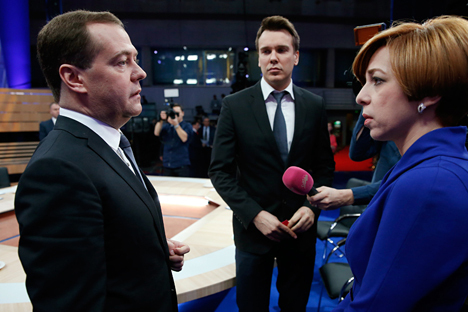 Medvedev pointed out that the Russian economy’s oil dependence does offer some positive aspects and advantages. “When oil prices grow, that gives us the opportunity to create reserves, and in the last few years we have formed quite decent gold and forex reserves that allow us to survive the crisis,” he said. However, Medvedev added that the sanctions imposed against Russia have a direct impact on economic growth. Medvedev said the national economy has lost tens of billions of dollars because of the sanctions imposed against Russia by the West. Meanwhile, the European economy lost 40 billion euros this year and is set to lose another 50 billion euros in 2015. However, he reminded the TV channels that sanctions have been imposed against Russia and the USSR before. He recalled the ban on gold purchases from the Soviet Union and the later prohibition on imports from the USSR imposed by the Jackson-Vanik Amendment of 1974. “We lived in conditions of permanently imposed sanctions throughout the entire 20th century,” Medvedev said. The latest sanctions have given the government occasion to think about import substitution. “The real losses seem to differ by several degrees of magnitude. Another thing is that the losses suffered by European companies are completely transparent and predictable,” Balakirev said, referring to the effects of the sanctions on business in the EU. The losses incurred by the Russian economy are much less obvious and include “a decline in efficiency, deferred projects, and a search for alternative suppliers, sales markets, and sources of financing,” he continued. According to a macroeconomic poll conducted by Reuters in November, the Russian economy will face a recession next year. Meanwhile, expectations surrounding economic growth rates for 2014 as a whole have somewhat improved, thanks to unexpectedly strong GDP statistics for the third quarter. According to preliminary data by the Russian Statistics Agency (Rosstat), the economy grew by 0.7 percent year-on-year in Q3, compared to 0.8 percent in Q2. On average, Reuters analysts predict 0.5 percent economic growth for 2014. “Losses from falling oil prices and the falling ruble, which are seemingly not connected with the sanctions, are much more difficult to tolerate under sanctions,” Balakirev said. Moreover, “we have all become twice as poor just so the budget’s oil revenues don’t fall in ruble terms,” he added. In the prime minister’s opinion, the authorities still have time to reverse Russia’s dependence on oil exports: “Time is not lost. We simply need to realize that the creation of this type of economy, diversification, will require not a year, not two years, not three years, not even ten years. This will take a lot of time,” he said. Russia has been fully dependent on oil for 40 years, and it needs some time to diversify, he said. The country developed its oil dependence back in the 1960s-1970s. As a result, Medvedev said the Russian economy is at least 50 percent dependent on hydrocarbons and fluctuations on the oil and gas market. The prime minister acknowledged that oil prices and the sanctions are reflected in the exchange rate. “This type of sanction creates certain expectations, as financiers like to say, and these expectations influence the moods of companies and ordinary citizens. So in some way or another it affects the situation with the ruble,” he said. “The results of the year are highly contradictory, but we have nonetheless managed to achieve the result we sought – a balanced budget system,” said Medvedev.